It was another nor' west day yesterday. This particular wind direction brings the planes into the airport on the "northwest runway". 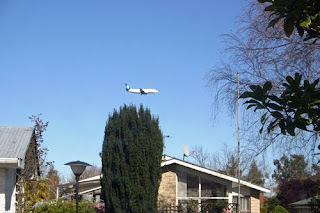 What it means is that all the planes from B767 size downward come flying past our house. The boys used to love it when they were younger going outside when they saw a plane fly by. In Christchurch it is a bit of a cheap pasttime to actually park your car beside this runway & watch the planes come in to land & take off. We've had many takeaway meals out there just watching the planes.